To present a video of laparoscopic right hepatectomy using Glissonian technique. A new strategy for liver transection is presented. Liver is divided in three parts. The posterior part, containing short hepatic veins, is divided with stapler before liver transection. Anterior part is fully divided with harmonic scalpel, and the middle part, containing hepatic veins from segments 5 and 8, is the last part to be transected. A 41-year-old woman with right-sided hepatolithiasis and choledocholithiasis was referred for surgical treatment. Patient was positioned in left lateral position. Four trocars were used. Operation began with division of liver ligaments, right liver mobilization, and exposure of the retrohepatic vena cava. Cholecystectomy was performed, followed by intrahepatic access to the right Glissonian pedicle (containing arterial, portal, and bile duct branches of segments 5–8). Two small incisions were performed around hilar plate according to specific anatomic landmarks. A vascular clamp was introduced into those incisions, resulting in ischemic delineation of right liver. Clamp was replaced by a vascular stapler, and stapler was fired. Liver parenchyma was divided by harmonic scalpel combined with vascular stapler. The specimen was extracted through suprapubic incision. 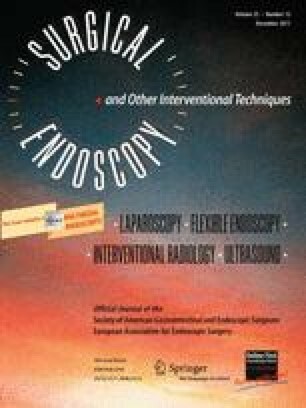 Intraoperative cholangiography confirmed a 2-cm common bile duct stone which was immediately removed by endoscopy (endoscopic retrograde cholangiopancreatography, ERCP). Falciform ligament was sutured to maintain the liver in its original anatomical position, avoiding hepatic vein kinking, and abdominal cavity was drained. Operative time was 180 min, with blood loss estimated at 50 ml, without need for transfusion. Postoperative recovery was uneventfully, and patient was discharged on the fourth postoperative day. Laparoscopic intrahepatic Glissonian approach is feasible and is a useful technique for rapid and safe control of the right liver pedicle, facilitating laparoscopic right hemihepatectomy. The special strategy described may help laparoscopic surgeons to safely perform this challenging procedure. The online version of this article (doi: 10.1007/s00464-011-1812-0) contains supplementary material, which is available to authorized users. Authors Machado, Surjan, and Makdissi have no conflicts of interest or financial ties to disclose.